Global Collaboration Day is a virtual celebration of globally connected teaching and learning taking place on Thursday, September 21st. On GCD, students, educators, and organizations are invited to host and attend events that demonstrate global collaboration powered by educational technology. Students, teachers, and organizations will come together online to celebrate and demonstrate global collaboration on September 21, 2017. On Global Collaboration Day, educators and professionals from around the world will host connective projects and events that invite public participation. This event is free for teachers and brought to you by Participate, GlobalEd Events, and the Global Education Conference Network. 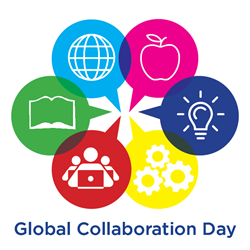 Global Collaboration Day serves to demonstrate the power of global connectivity in classrooms, schools, institutions of informal learning and universities around the world. Experienced global educators will share their expertise and introduce others to collaborative tools, resources, and projects that support the development of globally competent students and teachers. Global Collaboration Day activities support educational standards developed by the International Society for Technology in Education (ISTE) that call for student and teacher collaboration as well as teaching of the UN’s Sustainable Development Goals (SDGs). Global Collaboration Day is scheduled to take place on the International Day of Peace in participant time zones. Classrooms, schools, and organizations will design and host a variety of engaging online activities for others to join. Scheduled events range from mystery location calls to Twitter chats to asynchronous projects. All events are housed in a convenient online calendar viewable in participants’ time zones. Participants will also connect and share experiences via Twitter using the hashtag #globaled17 during the course of Global Collaboration Day. Note that due to religious holidays occurring around October 21st, attendees are welcome to host events any time during the week leading up to Global Collaboration Day. An exciting new addition to Global Collaboration Day this year will be the Global Education Fair, a virtual exhibition of projects and programs designed to benefit global learning. Exhibitors will include individual teachers with projects to pitch as well as organizations that provide services to help schools go global. A few organizations scheduled to exhibit include Amigos de las Americas, Global Glimpse, and OneWorld Classrooms. Global Collaboration Day is a project of GlobalEd Events and the Global Education Conference Network, a free online virtual conference that takes place every November during International Education Week. GCD, along with Global Education Day at ISTE and Global Leadership Week, are events designed to connect educators and facilitate year round global conversations in education. For more information and updates about Global Collaboration Day, please visit the GCD web site and follow @GlobalEdCon on Twitter. Special thanks to IREX for helping promote the Global Education Fair and to Participate for supporting this free event.